Check out Response Onscreen. You'll discover thoughtful reviews, recommendations, and conversations about film, including an interview with Blue Like Jazz director Steven Taylor. 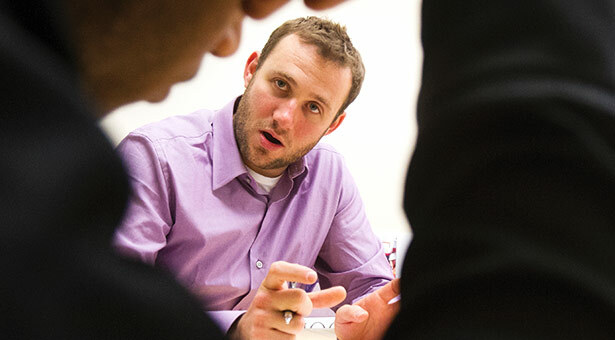 Ben Felleman MS '12, a doctoral student in clinical psychology, works as an interventionist with teens at Newport High School in Bellevue, Washington. When challenged about drug or alcohol abuse, the typical teenager shuts down. But what if that same teen encounters an intervention program that reduces alcohol consumption in youth by 200 percent and marijuana use by 73 percent? Project READY (Reducing the Effects of Alcohol and Drugs on Youth) does just that. And after eight weeks, READY achieves abstinence in 42 percent of its clients who used alcohol and in 38 percent of its clients who used marijuana. In one to two hours of coaching per week, clients are asked to take part in their own assessment. Based on their experience with substance abuse, they receive customized analyses of their individual situations, not group findings based on broad statistics. For instance, when a high school sophomore writes down how many drinks she's had in the last week, she discovers she's been drinking more than she thought, and she can then acknowledge the personal toll on her life. She receives counseling in how to make a change and achieve her life goals. Fifteen of Stewart's clinical psychology doctoral students in SPU's School of Psychology, Family, and Community act as interventionists at seven high schools in the Bellevue and Highline (Washington) School Districts. In the four years of the program's operation, more than 200 teens have participated in Project READY, and many of those have gotten their lives back on track. So surprised, she adds, that they will often refer their friends to the program. A typical client, says Serafini, might be a 16-year-old male caught drinking at the prom or with drug paraphernalia in his locker. His life is filled with extra activities and a job, and he's not interested in an after-school intervention that would interfere. He thinks everyone drinks or uses drugs and doesn't believe he has a problem. But he's been referred to Project READY and can participate for free and during school hours. It's worth a look. In most cases, the arms folded in defiance unfold. A rapport with the interventionist develops. The client completes an individualized assessment and sees that he's at risk. A path emerges for staying in school and finding balance. School district administrators say they are pleased with a university research study that doesn't simply extract data and move on but is committed to turning lives around.